Many congratulations to the Director of our MRC Human Immunology Unit for this prestigious honour recognizing his pioneering work on T cell immunology. 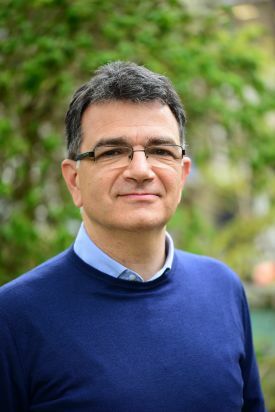 We are delighted to announce that Prof Vincenzo Cerundolo, Professor of Immunology at the Radcliffe Department of Medicine and Director of the MRC Human Immunology Unit, has been elected Fellow of the Royal Society. This is a highly prestigious award, recognizing his world leading research on T cell immunology, particularly his discoveries on how peptides and lipids are processed and presented to T cells. This research has opened new therapeutic avenues. Vincenzo Cerundolo was the first to demonstrate that Transporter Associated with Antigen Processing (TAP) genes within the major histocompatibility complex (MHC), transport peptides presented by MHC class I molecules and described a novel clinical syndrome in patients with defective TAP genes. He characterised the relationship between the length of peptides and their binding affinity to MHC class I molecules, explaining the homogeneous length of peptides isolated from MHC class I molecules. He also demonstrated that proteasome dependent degradation of antigenic proteins plays a key role not only in controlling presentation of intracellular, but also of extracellular proteins taken up by antigen presenting cells, hence defining the mechanism for the process known as cross-presentation. Prof Cerundolo has also characterised the structural and kinetic mechanisms by which lipids bind to CD1 molecules and how they are recognized by T cells. In addition, he demonstrated that harnessing CD1d restricted NKT cells enhances antigen specific antibody and T cell responses. These seminal findings have opened up novel therapeutic strategies to enhance immune responses against cancer and pathogens, an area of active research for his group. “I am extremely honoured and humbled to be receiving such an important recognition.” said Prof Cerundolo, “I am certain that working in the exciting and vibrant environment of the MRC WIMM and being able to collaborate with so many outstanding colleagues has contributed enormously to this achievement”. Prof Cerundolo obtained his Medical degree and PhD at the University of Padua (Italy). He joined the MRC WIMM in 1988 with a fellowship from the European Molecular Biology Organization (EMBO) and in 1995 was awarded an MRC Senior Clinical Fellowship. He was instrumental in the creation of the MRC Human Immunology Unit at the Institute, which since 1998 has been a leading research centre in human immunology, taking basic immunological discoveries and translating them into patients for the development of treatments against infectious diseases, cancer, allergy and autoimmune diseases. Prof Cerundolo has also been Deputy Director of the MRC WIMM since 2010 and is the Head of the Division of Investigative Medicine, Radcliffe Department of Medicine, at the University of Oxford. He is also Fellow of the Academy of Medical Sciences in the UK and Supernumerary Fellow at Merton College, Oxford. The Fellowship of the Royal Society is made up of the most eminent scientists, engineers and technologists from or living and working in the UK and the Commonwealth. New Fellows are elected, by their peers, on the basis of the excellence of their contribution to science. You can read more about this year’s elected Fellows on the Royal Society website.